Held Action lapsed into quietude again. The same thing happened about this time last year. I think it’s a combination of my real life job ramping up, prepping for Carnage in November and general blogging fatigue; the charge of blogging comes from the flow between writers and commenters, otherwise it’s typing in the wind. The current state of things is I have a heap of post ideas in single sentence draft form that I’m not moved to expand upon, a half dozen role-playing sessions of Scions of Time and Masks of Nyarlathotep to write up — though Masks is on hiatus for September as our earnest Keeper commits rites of matrimony with his chosen other — that, while fun, are fading into memory such that I don’t know if I can recreate the energy this far out. And that’s my own bad for filling my days with other activities. I’m taking a class this fall and it’s been long enough since college that I’m readjusting not only to blocking time for class itself, but homework, readings and so on. It’s been a bit surreal to dig out my last college notebook. In the intervening years since graduation, I filled many of the blank with game-related notes: character creation, adventure outlines, card counts, etc. Then I had to sift through my final semester of classes and years of gaming notes to find a stretch of blank pages to keep me through the middle of December. We’ll see how that goes. I may have to break down and buy a single subject notebook after all. I don’t want to give up writing here, but the old charge is gone. I need to feel like this is productive or useful to someone. And I know I’m talking about a gaming blog on the internet, so clearly my expectations need to adjust to fit reality. But it’s how my brain feels right now. In the meantime, I’ve got a few linky-loo posts to clear out of the inbox. They’ll appear in due course here, just to give the appearance of the lights staying on. Merrily careening through the vortex with no particular destination in sight, Challenger and his companions Airfor and Caradoc are thrown to the ground when the ship abruptly lurches to a halt. Challenger peers outside to see the breathtaking vistas of deep space before him, with a brilliant purple nebula filling much of the starscape — until the view is slowly obscured by silvery tendrils of a web-like substance. Meanwhile, Airfor discovers from the TARDIS console read-outs that the engines are straining at maximum capacity, yet getting nowhere. Challenger shuts them down while she repairs damaged linkages. Caradoc experiments on the webbing with a laser torch, finding that the web repairs itself nearly as fast as he can cut it. Using the chameleon circuit to transform the ship’s exterior into a sphere bristling with blades, Challenger cuts their way free of the web and the ship hurtles off into the void. The Scions of Time convened for the thrilling conclusion to the adventure begun in Ladies and Gentlemen, the Star Children, in which a 1970s counter-culture rock band possessed a seemingly undue influence over a steadily growing number of citizens of New York City. As the alien Star Child declares the invasion would begin, a purple light suffuses the night sky. Lighting fixtures shine over-brightly and explode, radiating outward from the precinct. The city streets take on an unearthly guise, illuminated only by the strange purple light radiating from the night sky with no apparent source. Challenger and his companions attempt to avoid the psychic invasion of Earth by running verbal rings around Wolfbrother. This keeps him non-plussed for a moment, but the effect of his grand declaration “The invasion begins!” becomes clear as they detect the footfalls of thousands of people marching in lockstep, converging on the precinct. Stacy keeps Wolfbrother at bay with the menacing application of hair-curling tongs. When we left the travelers, they were on an impromptu EVA to investigate a crystal lattice structure orbiting one of the inner planets of the stay system. A coruscating blue force projected from the crystalline object attacks the Paris, while a figure of the same blue energy appears to Challenger and Stacy, making telepathic contact with them to convey the message that they all needed to leave as quickly as possible. On board the Paris, Ms. Ferris and the rest of the bridge crew encounter a similar blue energy form, albeit a much more aggressive version that makes all sorts of threats and implications of violence via its telepathic link. After struggling to get back aboard the ship, Challenger and Stacy are briefly grilled on their EVA experience before the tactical officer detects a Draconian battle cruiser entering the crystal sphere through the hole the Paris created. A tense exchange between the two ships’ captains begins2, culminating in the Paris and its puny single mining laser beating feet out of the sphere. A struggle in the corridor outside sickbay ensues as Challenger tries to get Stacy back to his own ship, feeling confident she’d be free of the blue entity’s influence. Ferris disagrees. Strongly. While Challenger and Ferris are locked in grappling, Stacy makes off down the passageway, eventually arriving in the engine room, after a brief stop in the TARDIS to arm herself with a frying pan and anti-matter chopsticks. The security details Ferris called up scours the ship for Stacy, finding her at the controls of the “gustave,” the ship’s impeller drive, which bears an odd resemblance to the Eiffel Tower4, where she has completed some enigmatic task for her psychic companion. Threatening the integrity of the gustave with her anti-matter chopsticks, Stacy successfully bargains free passage for herself and Challenger back to their ship in the cargo hold. Ms. Ferris expresses uncertainty why that the stowaways would insist on cramming themselves into one of the Paris‘ cargo containers. This upgrades to bewilderment when the container emits a groaning, wheezing noise that culminates in the ship disappearing completely. Her attempt to debrief the captain doesn’t do justice to the nonsense that went on in the last half hour. 1 Thus ending the Angela Ferris curse; any time I ever prepared a game with a character named Angela Ferris, the game wouldn’t run. So I would recycle the name, being a perfectly good one that saved me having to conjure one up, and that game wouldn’t run and so on. 2 I realized as soon as the exchange began I’d fallen into yet another NPC versus NPC situation, which I could only try to resolve as quickly as possible, as there was no sensible way to involve Challenger or Stacy. In retrospect, I suppose the captain could have consulted Ms. Ferris. Did he? I can’t remember now. 3 Her player, Nonny, made some remarks about Stacy’s gerbil-sized brain that honestly made me kinda sad. I can’t remember them now, though. 4 In the future, all starships are powered by national monuments, apparently. Last week in Scions of Time, March 28th, we skipped even further ahead in time from The Crystal Sphere to a point where Challenger and Stacy had picked up a heavy metal rocker named Draketooth and reunited with Lionel Stroller, now advanced in years after settling down on a far-off planet for a time. The ship lands to what the travelers discovered to be the roaring applause of a concert audience. In his element, Draketooth leaps to join the band in an encore rendition of . . . something. Nobody else in the band with whom he jams is terribly certain what they are playing, but it seems to please the crowd. Stacy is greatly displeased by the licentious behavior of the band’s hangers-on, but fails to make much of an impression with her impassioned pleas to the audience or the participants in the after-show party. Lionel discovers they must be in the Fillmore East, sometime in the early 1970s judging by the dates on the show posters papering the backstage wall. Discouraged, Stacy stomps off to do “angry dishes” in the ship, now disguised as a stack of amplifiers, which is later moved out to the loading deck by a roadie. Meanwhile, Draketooth, Lionel and Challenger fall in with the band, the Star Children. Leaving the Fillmore, they are beset by fans, photographers and a very concerned older woman who addresses the lead singer, “Wolfbrother,” pleading for Matthew to come home. This and following conversation at the diner made Lionel suspicious. Remarks about expanding their audiences’ minds to new influences and the band members’ general vagueness about where they came from causes Lionel to probe deeper as subtly as he can. About this time, he suddenly notices all the band members have brilliantly violet eyes. Back on the loading dock of the Fillmore, Stacy emerges from her “angry dishes” to discover everyone has gone, except for a disreputable looking fellow in a shabby raincoat. Eventually introducing himself as Steven Greer, the self-proclaimed journalist for The Unquiet Times finds a red-hating kindred spirit in Stacy. She informs him of all the licentious, unamerican behavior going on at these rock shows. The travelers reunite when Stacy and her new friend track them to the diner. Wolfbrother and the Star Children invite them all to join “their community.” This turns out to be a combination of shanty town and festival in Central Park. Stacy notified a mounted policeman of the vagrants in the park while Lionel seeks out more violet-eyed people in the crowd. More mounted police appear to roust the community from the park. Lionel takes advantage of the ruckus to corner one of the violet-eyed people and extracts a surprising amount of information from him, revealing he is one of many psychic travelers who have come to Earth to flee their own planet, taking over the bodies of susceptible humans. The dust settles from the rousting of the Star Children’s squatter community, giving Challenger and his companions the opportunity to track “Wolfbrother” to the precinct where the police have taken him. Lighting fixtures in the police station shine impossibly brightly, then explode. The effect radiates outward from the interrogation room, as though power were being drained from the city grid by something with an insatiable appetite. The travelers are distinctly non-plussed. This session really clicked for me. There was a level of energy that I hadn’t felt before. I think a lot of that came from the players, as we had a line-up shuffle. Alex started playing his heavy metal character, who is much more high energy than the star fighter pilot Lieutenant Gorman. Nonny’s really gotten into her airhead car-hop character. Dan returned as Lionel after an absence, and got into it with gusto. Munk as Challenger really jumped into things at the end, trying to intimidate the Star Children into negotiating. A lot of the successful vibe about this session came from the characters. Their players were engaged and their characters showed it, particularly in how they interacted. As a GM, I feed off the enthusiasm they bring to the table, so knowing they’re happy help makes me happy. Everybody wins. Due to the blizzard two Mondays ago, we tried to have a make-up Scions of Time game this past Monday. That wound up being me, Nonny and Munk due to scheduling. So we had a mini adventure in which Munk’s incarnation of the Time Lord, dubbed Challenger because no one’s come up with a title they like, met Stacy the airhead car hop waitress at a dusty drive-in somewhere on the Extraterrestrial Highway in Nevada in the 1950s. As he ordered a milkshake, Challenger and Stacy got to talking about going places and doing things beyond Nevada. She’d started in Chicago and headed west, intending to get to Hollywood to become famous. When a pair of soldiers from the nearby base showed up to apprehend Challenger, he fled to his ship outside, taking Stacy with him on the promise of taking her to Paris. Where they wound up was the USS Paris, a scout ship orbiting a crystalline stellar object sometime in the future. They explored the ship a bit, met the crew, were brigged for a bit and then discovered the star system was entirely enclosed in a crystalline sphere that hadn’t been there a week ago. The sudden appearance of the sphere alone was interesting enough to attract the attention of a scout ship. The odd crystal object orbiting one of the inner planets they discovered once they burned their way in was even more interesting. We left off with the crystalline object reacting rather poorly to Challenger and Stacy’s EVA. I’m not sure if we’ll ever get back to that cliffhanger, as we’re not likely to have just Nonny and Munk at the table again. Maybe a future or past set of characters could happen across that moment and cross their timelines for some Blinovitch Limitation Effect fun. This session highlighted something about this group that we need to work out: everyone has a reactionary play style. I’m reactionary in that I feel I’m at my best when bouncing back from what the players do. And these players seem to wait for things to happen to them. This runs counter to my own conceptions of how an itinerant Time Lord behaves: being nosy, taking the lead in interactions and so on. So there’s a gap between expectations here. We talked a bit about it after the game, how it’s in genre for more proactivity and nosiness on the players’ part. To my mind, landing on a ship orbiting an interesting thing should be more than enough to get player characters curious, but I am steeped in the many veins of lore of Doctor Who, in which “wander around and get captured” is a valid method of information gathering and getting captured means the Doctor runs rings around his supposed custodians. That’s not every player’s style, though. My hope is that these things will emerge and even themselves out in play. While the others are off gallivanting around New Mexico, Trey the game show host discovers the rain room, an open field where it’s raining, on the verge of doing so or has just finished. He meets a lady in a green dress who makes some cryptic comments about being concerned “he wouldn’t be lonely,” concluding that Trey must not tell him she was here. He readily obliges — in that it probably slips his mind immediately. “That’s a very nice dress. Would you like to take it off? On returning to the ship, Airfor disappears into its depths with dismantling the Tzun saucers on her mind — her player, Jon, was out sick this week. 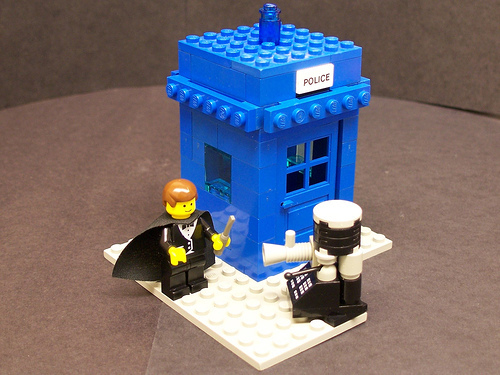 As Lionel the cardsharp takes in the impossible scale of the TARDIS’ central cloister, Victor attempts to pilot the ship forward to Lt. Gorman’s time. He overshoots a bit. It’s only through Gorman’s swift application of what he surmises to be the brake that the ship doesn’t go hurtling off into the cosmos to come, instead coming to a rest on the Needle, a massive cylindrical object a light year in length. Victor goes into a dramatic funk, dismayed by his inability to pilot the ship with any accuracy, bemoaning his profession, abilities and lack of general intelligence. Lionel introduces Victor to his horse, Trip Jacks, then grazing in the rain room. Rather than soothing Victor with the creature’s natural elegance and grace, Trip Jacks inspires the Time Lord to improve it with horns, poison sacs and more. His furious planning is interrupted by Adam calling the others to investigate a planet hopper craft he sees landing in a nearby valley. Exploring the Needle’s misshapen, Dali-esque landscape, the group discovers an archaeological expedition landing. Initially, the leader of the expedition, Professor Summerfield, takes a defensive stance, fearing the travelers are impinging on her survey zone. Then they offer to be porters, and she’s much more amenable to that. The travelers also learn about the oddities of the Needle: its impervious exterior, that it radiates heat and maintains an atmosphere for oxygen breathers. Victor attempts to probe the Needle with his sonic screwdriver; the surface reacts peculiarly, moving away from the screwdriver’s area of effect. On hearing a grinding noise rising and falling beneath the surface, Victor becomes convinced the Needle is alive. Last Monday we played the second episode of Scions of Time, “Way Out West.” Victor’s TARDIS landed in the wild west in 1876. After being “rescued” by a posse chasing a band of Apaches, the group was escorted into town, met a new cast member, a riverboat gambler on the run named Lionel Stroller, dealt with a alien spaceship buried in the nearby mountain and accidentally left Ed the starship deckmate behind, as Victor the Time Lord counted four heads when they arrived and four when they departed. I didn’t go into this session with a good feeling. Most of my preparation time went into idly noodling around the same ideas: the wild west, an alien spaceship trying to repair itself and the different ways it tries to co-opt the local inhabitants, either by turning them into laborers or substitute crew members. That wound up being muddled and probably not at all apparent to the players. In fact, most of the time went to trying to get Lionel connected with the rest of the group. Lionel’s player hadn’t been able to make the first game, so we tried to work his appearance into the narrative. In retrospect, it might have been easier to write Lionel in as having been part of the original batch of abductees on board the Tzun ship who had previously blended into the background. It would also have given his player, Dan, an equally wide range of possibilities in creating the character, but Dan got on board with a character from that time period quite readily. There at least two different forces at play here. First, the characters haven’t any bonds among each other at the moment. They all hail from different places and times. Having been thrown together, their common goal is to go home. Victor is currently their only means of doing so. This leads to situations where Adam the starfighter pilot quite rightly focuses on badgering Victor into taking them home. There’s little reason that a sensible person wouldn’t insist on pushing the “go” button as many times as it takes for the TARDIS to land somewhere slightly relevant. In the early days of Doctor Who, the writers used multiple techniques to handle that concern. First, the Doctor’s TARDIS couldn’t steer then for squat, making it nigh-impossible for the Doctor to return them home. But that’s not enough to stop a determined person from strong-arming their pilot into trying again and again. So at that time, the Doctor was insatiably curious and often a selfish heel. He was often a provoker of action and conflict, which were then left to the other characters to resolve as best they could. In The Daleks, he went so far as to sabotage the TARDIS to justify exploring the planet. So one thing this group needs is motivation to leave the TARDIS. This should be character-driven, rather than relying on problems like life support failing to propel them into the crosshairs. The other force at play is . . . I’m not sure. It’s been long enough since I started that sentence up above that I can’t remember what I was thinking. I will say that I honestly had a period of time during this session where I mentally sighed and resigned myself to a band of sociopaths running amok through time and space, about when Airfor gunned down poker players in a hail of flechettes. Things looked up, though, when Airfor’s player remarked out of character that he saw her as needing someone to provide moral guidance. I felt silly after that for doubting there was a motive behind the decision. Jon’s got a character arc in mind for Airfor, so I can leave that to him to explore. Next session, I want to open things up. It’s time to leap off the mudball. And lay out some background details. We met Monday evening for the pilot episode of Scions of Time, the Doctor Who-based campaign that has been the end result of me getting off my duff and doing things I’ve only idly considered before. It was not super-orchestrated on my part, because my personal experiences have confirmed that while spending time on a strong set-up to a role-playing adventure pays off, giving any thought to conclusions does not. In fact, I’ve been frustrated in the past trying to tie what the player characters are doing to my own preconceptions about how things “should” end. This time, I went ultra-loose, deciding to rely on the players taking most of the initiative. I chose a very bare bones set-up of people being snatched from various points in the history of Earth. They awake to find themselves in a curious metal room with a window . . . overlooking the Earth. From there, the players interacted for a bit — a situation that, in retrospect, probably wasn’t wise to force, because this was the first outing for everyone. But it worked all right. Meanwhile, Victor, Nonny’s runaway Time Lord scientist, first appears in intercut scenes of fleeing Gallifrey during the climax of “The End of Time,” breaking through the transduction barriers and triggering a systems overload that knocks him out for the count, prompting disquieting dreams of pain and fire, of flights of Daleks blotting out the sun and darker creatures Victor knows are his. Monday evening, I fell asleep still buzzing with excitement. Earlier in the evening, we newly-minted Scions of Time met to create characters for this campaign. As promised, I’m turning my thoughts into actions and finally getting a campaign off the ground. The main gimmick of Scions of Time borrows from Ars Magica‘s troupe play model. There’s a pool of characters that are drawn from for individual story arcs. This way, every player has their own personalized incarnation of the Time Lord, as well as companion characters to play alongside other player’s Time Lord personas. Also coming from Ars Magica are the power level tiers: the Time Lord’s abilities and knowledge makes him analogous to magi. Then there are the competent companions, your Marthas and Captain Jacks. Then you’ve got your Mickeys and Jackies, who rough out to match grogs, the servants and comic relief in a Hermetic covenant. And yes, characters can move between the tiers. Mickey eventually became a very competent companion, once he socked away enough experience points. Donna broke through to the Time Lord tier, albeit temporarily. So on Monday evening, we got together to make characters. We’d had some conversation online beforehand, as I wanted to make this as collective a process as possible. The players are going to share the lives of a Time Lord, so the basic essence of the character had to be something they all wanted to play; my own primary concern was that the character kept to the basic spirit of Doctor Who: having mad adventures and generally doing good. After a lot of discussion and throwing ideas out on the table, the group landed on someone who escaped from Gallifrey during the few moments it hung in the sky over Earth during “The End of Time.” He’s some sort of veteran soldier or weapons researcher scarred by what he saw happen in the Time War, so he has a motivation to work to prevent any more atrocities like that. Specifically how he escaped or what he did in the war are questions we’ll let be answered through the course of play. His TARDIS is young and immature, taken straight from the creche. Still forming, it behaves unpredictably and lacks some of the abilities of a fully-cultured time ship. The idea reminds me of Talyn from Farscape, of all things. He struck me as an impetuous, hot-headed ship, though that might have been Crais’ influence as much as anything. Our Time Lord’s going to be the traditional roving renegade, I think. The companions are a somewhat more varied lot. On Monday, everyone made two: a competent companion and a tin dog, as the slang emerged. Concepts included: a starfighter pilot, a 19th century physics professor, a post-apocalyptic junker, a Sudanese lost boy, a 50s rollerskating waitress, a hair metal wanna-be rock star, a 1920s rum runner and a game show host with exceptional hair. Additionally, I have some ideas for pick-up characters that I’ll create over the weekend, in case anyone wants to drop for a week and help those players who couldn’t make character creation catch up. Next Monday is our big pilot episode, bringing together a number of disparate companions and a mysterious alien fleeing a world on fire, discovering that the universe isn’t like he remembers it at all. This should be good! I’ll keep you updated as we play, natch.